I waited for NS (Horizontal Red Line). 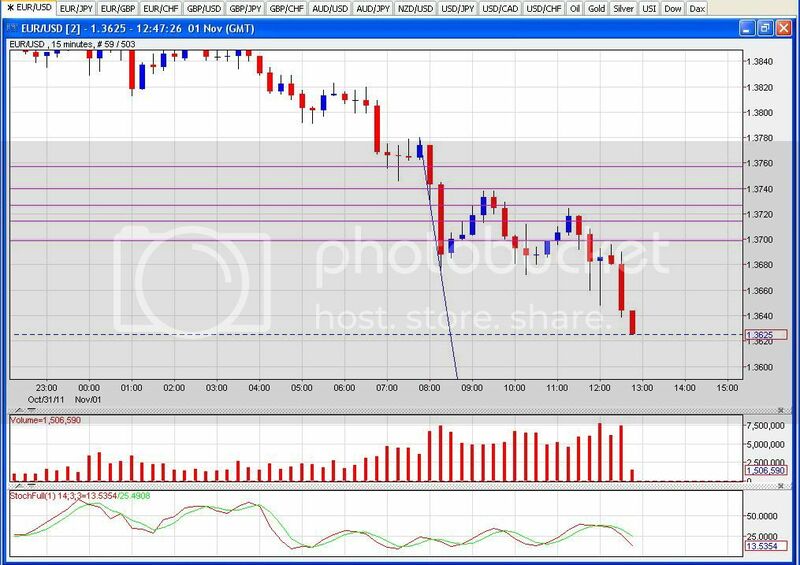 Got in the trade a bit late but maybe that was a good idea considering that it did bounce off the 50 Fibb like you said. Still happy to enter the trade for a long. Crashed and burnt. Oh well, thats what Stop Loses are for. oops! I entered after that NS that you marked, but locked BE early…still hunting long. We see profit taking/demand/accumulation, but not ready for a markup phase. Up moves not breaking 5 min swing highs, but drifting back down on low volume…SM is not ready for markup mode…still buying low. Observe their mode. Watching that 1.3650 old support now. Thanks for the heads up Pete! Going short was the easier trade this morning - stock markets were taking a beating all over, Euro bank shares were going down 10% or more. There was a nice entry offered when it retraced 61% of the London open drop on lower volume than the drop itself - entered short on the second candle at the 61% mark. Looking for longs in this sort of massive risk-off environment is hazardous - going with the flow is a simpler trade. Aiming for 1.36 though might close out before that if there’s too much resistance showing there. I like your live chart. You made no mistake on this, although price bounced back down on Fibonacci 61.8 what was not a good hint to buy imo. But thats my opinion, I like price to pass fibo 50-61.8 area to go long. Looking at EUR/USD 4h and 1h it looks like supply came in days before Papandreou’s announcement. Am I correct to assume that the professionals knew about the announcement beforehand? They didn’t know about it. Nobody knew about it - surprised a bunch of people in even in his own party. The selling started after people went over the details of the EU package over the weekend and began to see it as not being enough. Another case of the EU over-promising and under-delivering. Risk was off in early trade in the week and it’s snowballed since then. Yes, makes a lot of sense. Thanks. Did you notice that as the price dropped, the retraces basically hit the 61.8 fib lines and went back in the direction of the prevailing down trend. I think many of us were looking for an end to the trend after seeing so much strength in the background, but maybe went long a bit early. I made two trades last night. 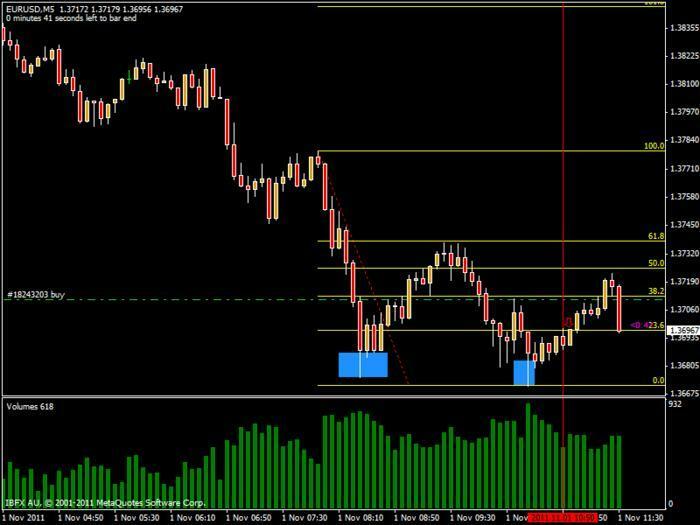 The first one, I moved S/L to B/E after about 10 pips after some discussions about possibly not going too far and to protect my capital. That was stopped out at Breakeven. Woke up this morning and it hit T/P after 3 hours. It did go a little past there, but then pulled back a fair bit. Yes I did notice the retraces. Really good explanation with the chart mate:18:. Its ok because I wear glasses for reading anyway. Like so many others I thought it would head north. After stopping out earlier I left a pending order, set the TP & SL and went to bed. Had to work this morning. A nice surprise this afternoon. If I was trading with a live account I wouldnt have set it up and left it.I`m glad to see that you pulled that trade off to. This VSA is getting really exciting stuff. I find I understand it so much better with a “mentor” type person helping out a bit I will get there in the end, but it is always good having a bit of a hand until it all becomes an unconscious habit. I only picked up yesterday the bit for when it breaks through the 61 fib level to wait for a NS confirmation etc, rather than look for it before the fib level. Sort of waiting until it passes through the resistance at that fib as such. 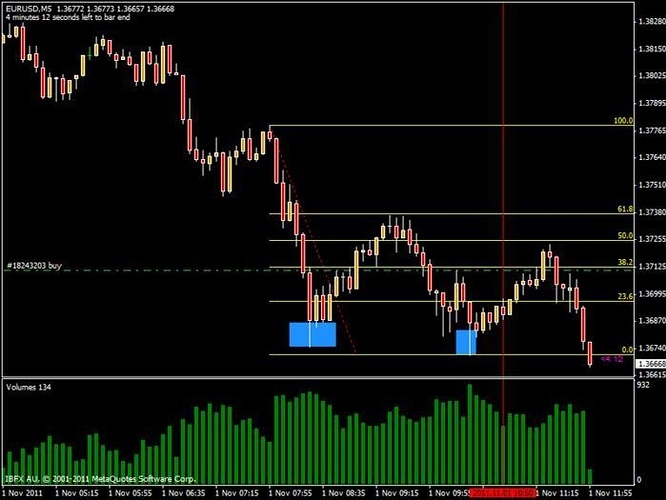 Lose some pips while waiting, but don’t get the bounces off it like there was yesterday. Yep! I know what you mean the penny dropped for me too over that very subject last night. Again that short and sweet video from Pete yesterday was a great addition to the library. I wish that I could put his trading brain on a USB stick. It really is just chart time and watching what price is doing in relation to volume. We will get there!!! Good stuff guys. Just to be clear, I don’t normally wait for the 61.8 to break on 5 min before going long, but it is a good sign. I was being cautious because we had already seen stopping volume on down moves that still had price continue lower. Once a saw that 61.8 consistantly holding on the retraces, and knowing the importance of it, I waited for a break. This tells me the demand in the background was finaly playing out in price. Giving the NS just above made it picture perfect, but I could have easily passed on that entry if it hadn’t set up so nicely. Looks like I was wrong. SM are still accumulating. This is a supply ridden up move. Sure, we saw the demand yesterday that can explain this move up, but it’s not a healthy markup showing constant supply coming in as price moves up. Right now I’m waiting and expect when it’s done attempting to markup…whenever that is, I’ll get a nice down move to catch. Again, there is selling going on into this markup. I consider it too risky to long and it should make for a nice down move to catch. That’s where I am now…see what NY brings. Thanks, I couldn’t really make up my mind where the market were heading at first. My thoughts were this; I saw a high vol (solid) up bar through 61.8, my first thought was bullish but as the next bar didn’t close above and the next few candles after that had a hard time to make it higher I was heading more to the bearish side. Were the high volume up bar through 61.8 a little too high volume to be considered as bullish? Looking at it now it surely looks like alot of supply showed up when we entered this area.